Our accessible cabin at Point Beach National Forest, on the shore of Lake Michigan. Since Cherrie like the Colorado yurts so much, we decided to spend some time in a rustic cabin on Lake Michigan. 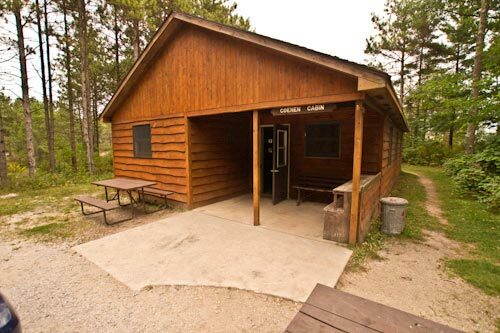 Technically these two cabins at Point Beach State Forest are group cabins, but hey, three is a group, right? The price was right – a very reasonable $60 – so we decided to go for it. And we weren’t disappointed with the accessibility either. The Wisconsin DNR did a great job. We stayed in what they call a rustic cabin, which means there is no running water or electricity. No worries though, as there is an accessible pit toilet just across form the cabin. Additionally, there is fresh water available form the pump in front of the cabin. And there’s even an electric outlet by the pump for emergencies. We didnt' have any electricity, but this accessible fire ring served us well! I have to say we were very comfortable in the cabin, with flashlights and sleeping bags. There was also a grill outside for cooking and a nice fire circle. And the view of the lake from the end of the accessible boardwalk was fabulous. Even better – nobody booked the other cabin, so we had the place all to ourselves. That’s the advantage to booking a cabin the day after Labor Day! Of course since there was no water at the cabin, there were no showers either. 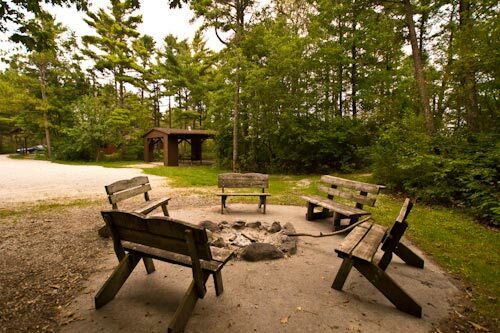 Again, not a big problem, as we just hopped in the car and used the accessible showers down at the main campground. And while we were there we explored a bit. Although there are no accessible trails, there is a nice overlook behind the Nature Center, which offers a great view of Lake Michigan. And don’t miss the Rawley Point Lighthouse, which you can get a pretty good gander at from the Lighthouse Picnic Area. Perched above a steel tower which rises 113 feet above the lake, this working lighthouse has been operating since 1853. The original brick tower lighthouse was cut down to house size and served as part of the lighthouse keeper’s house for many years. Unfortunately before they could construct the current lighthouse 26 ships were stranded on the point, and the steamship Vernon went down in heavy seas in 1887. Thankfully after the new lighthouse came on line, the tragedies ended. 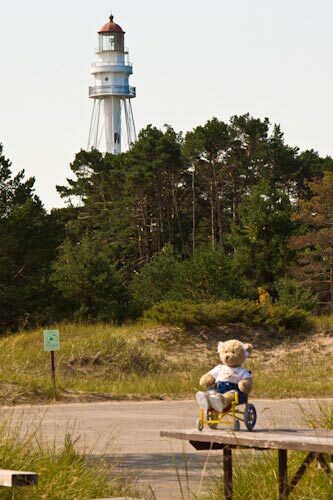 Cherrie enjoyed Rawley Point Lighthouse at at the Point Beach Campground. Cherrie really enjoyed learning about Michigan maritime history and taking in the beautiful views of the lake. And she really liked roughing it in the accessible cabin. And the moral of the story is – accessible accommodations come in all sizes and price ranges. You just have to keep your eyes open!! This entry was posted in Lodging, Recreation, Road Trips, Traveling Cherrie and tagged barrier-free, cabin, camping, disabled travel, Point Beach, SATW, Traveling Teddy, wheelchair, Wheelchair Accessible by Candy B. Harrington. Bookmark the permalink.